Paul Hamilton: Is History-Free Design For Real? I get the feeling that many people view history-free, explicit, direct modeling (whatever you want to call it) as some new experiment that may or may not make it in the market. It seems that some think you really can’t do serious design work with it, that it is something only useful when simple edits are needed with non-native CAD data or when history trees get too cumbersome. This may be due to the fact that some history-free technologies, including some that have recently been introduced, are in fact better suited for simple geometry editing rather than full on product design. 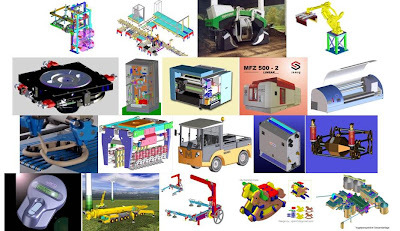 Flexible robust history-free modeling technology has been used all around the globe for the last fifteen years (or more) to design hundreds of thousands of successful products. As an example, most all of the printers you see on the shelves at Best Buy are designed, from concept to detail, using history-free modeling technology. It is real and it does work, for many companies. The percentage of companies using history-free technology for product design is certainly smaller than that of companies using history-based technology, but product design with the help of history-free technology is growing rapidly. Just talking for PTC CoCreate Modeling, PTC claims that there are over 57,000 companies around the globe using CoCreate Modeling to design products. Most of these moved from history-based modeling after recognizing that history-free modeling better supported their processes than did history-based. I can tell you that most of these companies know intimately the benefits of history-based modeling, but they chose history-free, usually based on process and product requirements. There are certainly some that tried it and moved back, but the number of companies using history-free technologies for product design is growing. I would suspect that the same is true for Kubotek and SpaceClaim. This explains why other CAD vendors are trying to introduce similar capabilities as quickly as possible. 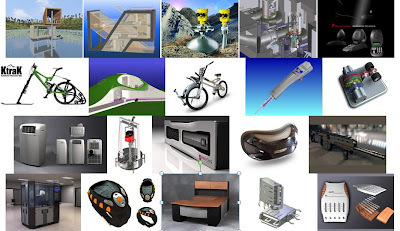 Here is a quick collage of images that represent a small fraction of a percent of real, successful products that have been brought to market with the help of history-free modeling (courtesy of the PTC CoCreate web site). 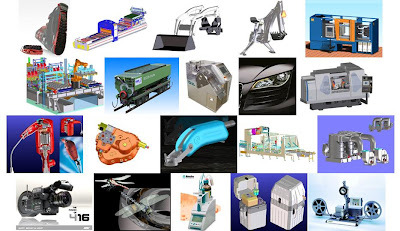 From Aerospace to automotive, from high-tech electronics to machinery. They have all realized the benefits of history-free product design, and continue to bring innovative products to the market in a competitive, timely and successful manor - without a history tree. Using history-free modeling for product design is not some new concept. It is real and has been proven to help many companies around the globe innovate and successfully compete in their market. History-free does not mean that you have to give up design intent. CoCreate Modeling, as well as a few other tools, allow for 3D features, constraints, parameters, driving and driven dimensions, tolerances, GD&T, and annotation, all directly on the 3D parts and assemblies. History-free simply means that you are interacting directly with geometry rather than through the recorded sketches, parameters and features that are structured in the typical history tree during the modeling process. It doesn't fit every company, but it would be wise to be sure you are using the best tools to support your processes and requirements. Now for a commercial: If you would actually like to try history-free design, PTC is hosting two free hands-on workshops coming up in mid March. March 17 in San Jose and March 19 in Boston (Needham). I will be at each and will be providing a quick presentation on the technologies and the benefits to product development, and then you will spend the rest of the time with some hands-on introduction and training. Should be a fun time. So if you are in the area, please stop by. Here is a link to the registration. To be fair Paul, your assessment is right, up to a point. Its common for the use of CoCreate's modelling technology to be used in conjunction with another 3D design tool. 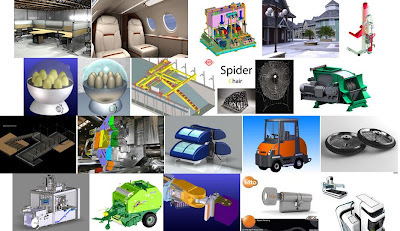 Typically you'll find that products with complex exterior surfaces (which CoCreate isn't that good at handling) are designed elswhere (typically Alias or something along those lines) and the 'engineering' forms created using the direct modeling tools. I guess this is much of the problem. When talking about the 20 year 'overnight' success of Direct editing of geometry, the fans, the vendors and some of the users forget that even today, with ever more powerful systems available, many users are using mixed environments, different tools for different tasks, for different processes. The combination of Alias and Pro/E is still massive. Rhino sits alongside SolidWorks et al. There are no hard and fast rules. People are using the tools they need, to do the job they need. I think pretending anything else is foolish and inaccurate. As you wisely said "It doesn't fit every company, but it would be wise to be sure you are using the best tools to support your processes and requirements." I couldn't agree more..
Love the blog - a lot of signal in a world of noise brother. I find it simply amazing that a small company like SolidCAM truly understands how to make best use of video on their website but a large company with far greater resources like PTC hasn’t got clue one on how to really use video teach a potential user what CoCreate can really do. I’d like to suggest you check out the SolidCAM Professor (Sidney Eisner) part of the SolidCAM website to see how CADCAM should be marketed rather than what PTC is now doing for CoCreate... offering seminars that reach a very limited number of people. Thanks for the comments Al. I do agree with you. 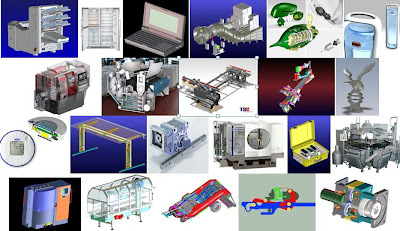 I don't want to imply that the CoCreate CAD tool, or any CAD tool for that matter, is the one and only tool that is used within the product development cycle. There are even companies that are using history-based and history-free technologies complimentary - perhaps history-free for concept design and history-base for detail design. 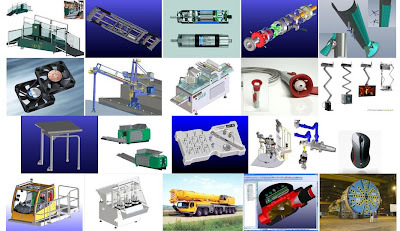 There are so many different ways that 3D CAD is used, by so many different types of companies, by so many different types of people. As you say "there are no hard and fast rules". Thanks for pointing that out.